Mars Climate Orbiter during acoustic tests to simulate launch conditions. The spacecraft was lost on Sept. 23, 1999, due to a conversion error. 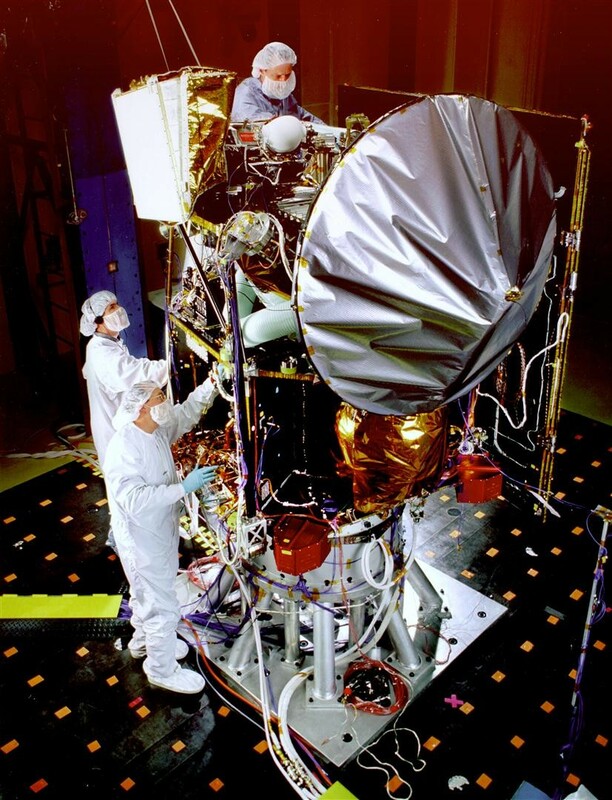 Just a week after the Mars Climate Orbiter was lost in September 1999, NASA figured out that the cause of the fiasco was a mix-up of units. The Lockheed Martin engineering team that built the spacecraft used English units of measurement for a key parameter, while NASA's operation team employed the metric system. This resulted in the orbiter receiving erroneous instructions for its orbital insertion maneuver. Instead of going into Mars orbit, it probably burned up deep in the planet's atmosphere. OK, it is rocket science, but it still seems incredible that such a mix-up could happen between some of the smartest engineering teams on the planet, and it's worth looking at the details. Specifically, the "Angular Momentum Desaturation" flight software calculated the performance of the spacecraft's braking thrusters in English (or Imperial) pound-force units, while the ground crew trajectory modelers assumed the output was in metric Newtons. Since 1 pound force = 4.45 Newtons, the navigation software algorithm underestimated the effect of the braking thrusters by a factor of 4.45. And there went $125 million of spacecraft. I was reminded of this while reading September's PCWorld magazine "Corrections" box, in which this tech-savvy crew of writers and editors managed to compound an initial gaffe in their August issue. Comparing the Samsung Galaxy tablet with Apple's iPad 2, the writer stated that the Samsung tablet weighs "1.25 pounds, 0.8 pound less than the iPad 2." Since the iPad 2 weighs in at 1.33 pounds, she obviously meant 0.08 pounds (that damn decimal point). In the following issue, the "correction" managed to substitute 0.08 ounces for 0.08 pounds. If Lockheed Martin, NASA, and the staff of PCWorld can screw up so easily, what hope is there for the rest of us? The solution might once have been "metrication," i.e. universal adoption of the metric system for physical measurements, which began in France in the 1790s during the Revolution. But I'm pessimistic. For instance, after Caltrans was well on the way to adopting a fully metric system for highway design and construction, the agency switched horses mid-stream. In a memo dated June 16, 2006, Richard Land, Caltrans chief engineer, mandated that "...all Plans, Specifications and Estimate submittals...must be in English units." Length: "...4.5 feet above ground"; "Trailer length: 28 feet 6 inches..."; "24-inch diameter culvert"; "At PM [Post Mile] 1.67 which is about 200 feet south..."; "180 feet in length and rises 54 inches"; "18 inches to 15 feet"; "1/2 inch depth"; "0.75 foot...4 inches [in adjacent sentences]"
Area: "0.56 acre"; "1/4 acre"; "1650 ft2"
As a result of the orbiter calamity, NASA has adopted strict rules for the unwavering use of metric units. Couldn't the rest of the country follow its lead? Barry Evans' (barryevans9@yahoo.com) vitals are 65.0 kg x 2.64 m x 68.97 yr. His books, including the first Field Notes compendium, are at Northtown Books and Eureka Books.